The Sri Kedarnathji shrine, one of the 12 Jyotirlingas of Lord Shiva, is a scenic spot situated, against the backdrop of the majestic Sri Kedarnathji range. At an altitude of 3,581 mts. It is a 14 kms. 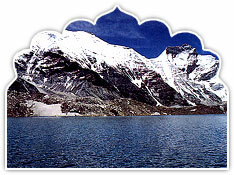 trek from Gaurikund. Kedar is another name of Lord Shiva the protector and the destroyer. Shiva, is considered the embodiment of all passions-love, hatred, fear, death and mysticism which are expressed through his various forms. There are more than 200 shrines dedicated to Lord Shiva in Chamoli district itself, the most important one is Sri Kedarnathji. According to legend, the Pandavas after having won over the Kauravas in the Kurukshetra war, felt guilty of having killed their own brothers and sought the blessings of Lord Shiva for redemption. He eluded them repeatedly and while fleeing took refuge at Sri Kedarnathji in the form of a bull. On being followed he dived into the ground, leaving his hump on the surface. The remaining portions of Lord Shiva appeared at four other places and are worshipped there as his manifestations. The arms appeared at Tungnath, the face at Rudranath, the belly at Madmaheshwar and his locks (hair) with head at Kalpeshwar. 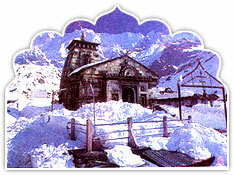 Sri Kedarnathji and the four above mentioned shrines are treated as Panch Kedar. Sri Kedarnathji is approachable on foot from Gaurikund, which is connected by road with Rishikesh, Kotdwara, Dehradun, Haridwar and other important hill stations of Garhwal and Kumaon Hills.